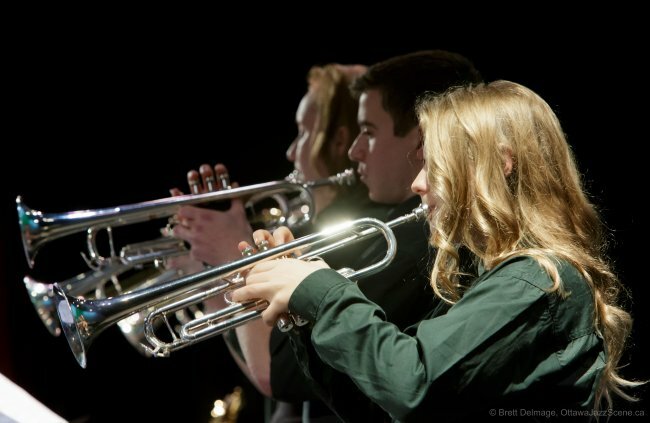 Welcome to the Nepean All-City Jazz Band's Website. Here you can see when we perform, and know more about the band. Julian Zanetti (trumpet, NACJB, 2006-2011) passed away August 4, 2018. The entire NACJB family extends our condolences to Julian's parents Marco and Lesli, and to the whole Zanetti family. An event to remember and honour Julian was held on Friday, October 19, 2018 at the Orange Art Gallery, 290 City Centre Avenue. Current NACJB musicians Vincent Ribberink (piano) and Matt Roberts (trumpet) performed in memory of Julian’s involvement with the band. Julian’s family has created a gofundme.com/jzanetti-memorial-fund-for-nacjb link to create an award for deserving NACJB members. We encourage you to contribute in Julian’s honour. CONDUCTED BY NEIL YORKE-SLADER, THE NEPEAN ALL-CITY JAZZ BAND (KNOWN TO MANY AS 'NACJB' OR SIMPLY 'ALL-CITY') COMPRISES 18 MUSICIANS BETWEEN THE AGES OF 15 AND 19 DRAWN FROM ALL OVER THE GREATER OTTAWA AREA. MANY NACJB ALUMNI HAVE GONE ON TO STUDY MUSIC AT PRESTIGIOUS INSTITUTIONS IN CANADA AND THE U.S., MOST WITH FINANCIAL SCHOLARSHIP ASSISTANCE AWARDED FOR EXCELLENCE AT MUSICFEST CANADA'S NATIONAL FINALS. NACJB HAS HAD GREAT SUCCESS AT MUSICFEST NATIONALS, EARNING GOLD STANDING IN EACH OF THE PAST 30 YEARS. The Nepean All-City Lab Band is the new "sister" band of the Nepean All-City organization. A clear need was identified to form a new High School level Jazz Band in Ottawa, where young players who couldn't be part of the NACJB could showcase their talents. This new ensemble is comprised of young talented players, age 14 to 17 years old, in need of deepening their craft and engaging in an advanced level repertoire. Their inaugural concert in December 2017, was mentioned in an article by Ottawa Jazz Scene, discussing the rationale behind the birth of NACLB.